The holidays are here and I cannot seem to get enough gingerbread flavored goodies! This recipe is a great use of leftover Thanksgiving cranberry sauce. I had mine in the freezer and pulled it out to make these gems. For the cranberry sauce recipe, click here. These would be a perfect Christmas morning breakfast to nibble on as you opened your gifts. It will also make your house smell amazing! When they first came out of the oven, my husband, Marcus, inhaled two of them so I knew they had to be good. 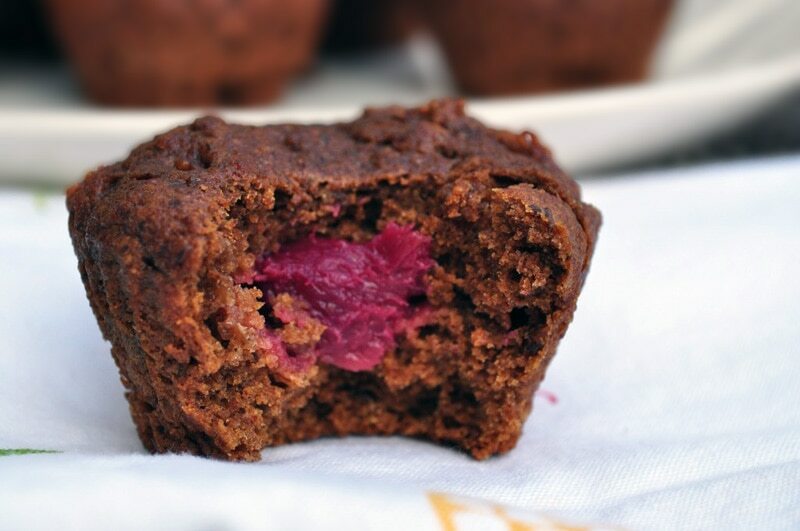 These muffins are made with whole grains so they are much healthier than traditional muffins. This recipe is similar to my healthy gingerbread donuts. For that recipe click here. Preheat oven to 350. Mix all the dry ingredients in one bowl. Mix wet into another. Add dry to wet. Spoon a small amount of batter into each lined muffin cup. Add a dollop of cranberry on top of each one. 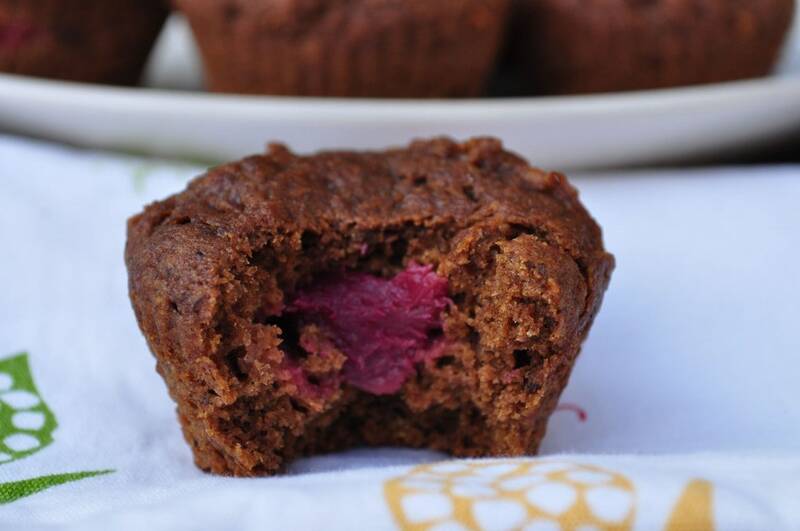 Fill muffin cups until they are about 3/4 full. Bake in the oven for 15-17 minutes or until a toothpick comes out clean. Wait until they have cooled a bit before removing from the muffin pan. Enjoy! How do I make a flax egg replacement. Just combine 1 T flax meal + 3 T water. Whisk it and throw it in the fridge for a minute. It will become gummy like an egg. Could you sub spelt flour with whole wheat or something? And I have fresh cranberries, but nothing to make it into cranberry sauce...I guess instead of making a filling, could I just add fresh cranberries to the mix and it still turn out good? You can sub whole wheat flour for sure. Adding fresh cranberries may give it a tart taste since cranberries on their own are very tart. If you like that, then feel free to try it. Let me know how it works out. I loved this recipe and the idea of using left over Cranberry Pear Sauce in these! I shared your link on my blog as an idea for leftover sauce, I hope thats ok, Happy Thanksgiving! Thanks Kristen! My family loves them! Looks, amazing but I couldn´t find any yield count. Is this recipe for 12 muffins? 20? I´d be glad if someone clarifies this, I really hate when the recipe indicates an incorrect proportion, and I have to fill my muffin tins full of batter ending up with mushroom like muffins sticked all around. Thank you!